As the old year wanes and there are these few final days during which to think about the incoming New Year, I suddenly remembered a little statement that I had caught during the fascinating PBS film, A Murder of Crows. It seems something important to remember - for me, at least - as 2012 dawns. "Play allows the mind to develop and thus the crows become more creative." I think that pertains to us all, corvids, humans, and everyone in between. As artists, it is so important to play, to revert in a way to a childlike mental state, to relax. Every time I remember to do this, I find that the art I am trying to create seems to flow better. Think of some of Henri Matisse's dancers; here, he seems to have distilled his art to a marvellous sense of joyous play. Above is a second version of Dance that Matisse did in 1909-1910, the version now in the State Hermitage Museum . But then fast forward to 1947, when Matisse had to resort to paper cut-outs, papiers coupes, because his infirmities precluded him from painting. He still retained a sense of play, and his creativity was undimmed. Icarus (Jazz), papiers coupes, 1947, (image courtesy of the Metropolitan Museum of Art, New York). How more eloquent an example of play allowing creativity to flow can one get! The crows can certainly teach us a lot. So can Matisse! Happy New Year to all, and joyful play. It is the time of year when we all hear murmurs of New Year resolutions that we should be thinking about, in the knowledge that most of the good resolutions don't last very long after January 1st has passed. Nonetheless, one resolution that I think would be good for me to try and adhere to is keeping a playful and enquiring optic about making art. Perhaps almost the attitude of "let's just launch out into space and see what happens in the art", something I often have misgivings about, especially in unforgiving silverpoint. Stephen Nachmanovich, the noted improvisationist violinist and, amongst other achievements, author of Free Play: Improvisation in Life and Art, said, "Play is the taproot from which original art springs. It is the raw stuff that the artist channels with all his hearing and technique." He could just as easily have said "seeing and technique". He maintains that every time we open our mouths to say something, we are in fact improvising, and that creativity is in the same category, given to everyone. In truth, when one is about to launch into a plein air painting or drawing, it is very much an act of improvisation. Since weather conditions, light and innumerable other aspects can change from one moment to the next, one has to regard the whole endeavour as play, as a challenge that is fun. In other types of art, the mere act of turning off the left hand side of the brain and ceasing to think turns it all into a much more venturesome affair, where there is indeed a sense of playfulness and a sense of gambling. Perhaps one of the best demonstrations of that type of art is when an artist is creating a painting or drawing as music is performed live. My fellow artist and friend, Lori Gene, epitomises this sense of play in a very sophisticated fashion in her art created alongside musicians as they play. I always remember Marc Chagall, in his eighties, saying that every artist should retain a childlike optic on life. Indeed, his sense of play was the source of amazingly original art. Perhaps it would indeed be good to resolve to be more playful in art making as the New Year rolls in. I talked in an earlier blog about the insights into the value of play in our daily lives and the role that play has in allowing artists to develop and create. I was reflecting again on the way artists can play in creating art, and realised that there is another aspect to this activity of play. When I am drawing or painting, a private game that I play with myself is seeing how I can convey the essence of my perceived reality - be it landscape, flower, person - with the minimum of lines (in drawing) or colour (in painting). I try to distill the subject to the absolute minimum of detail which still allows the viewer to recognise (more or less!) what is being portrayed. Each work is an endlessly interesting challenge in this respect. Organising abstraction as visual elements that convey reality is really a game to see how best one can succeed in minimalist depiction of the subject matter. 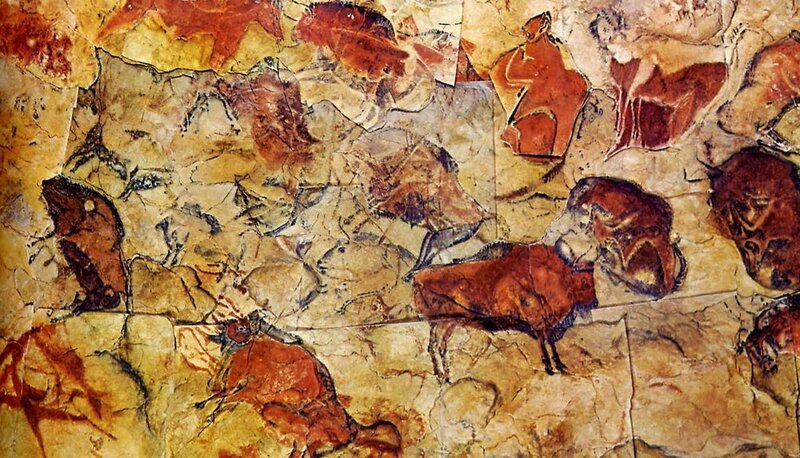 Artists have done this since time immemorial - think of the essence of bison galloping across the walls of Altamira or the aurochs of Lascaux. Dolphins cavorting across the frescoed walls of Minoan palaces and octupii reaching around their painted ceramic jars come to mind too. In all these cases, the imagery is distilled and organised almost to the point of abstraction, yet utter realism results - powerful, arresting and memorable. Old Masters, from Renaissance times onwards, also skilfully selected and simplified design elements to make their compositions more successful and beautiful. They used the abstraction of closely related values joined together in massed forms, which allowed the viewer's eye to be led to the focal points which are depicted realistically. Abstraction was certainly not the "invention" of the 20th century. If you carefully study any good drawing or painting, of no matter what era, that is purportedly realistic, you can see all sorts of amazing elisions, squiggles, blobs and lines that seem to have nothing to do specifically with the subject being depicted. Yet, when looked at as a whole, the art is convincing. I am sure, too, that the artist was probably having fun and enjoying playing as the work progressed. I listened with fascination this morning on National Public Radio to a programme, Play, Spirit and Character, on Krista Tippett's show, Speaking of Faith, which talked of playing and its importance in life. Stuart Brown was being interviewed. His wisdom and insights on how animals and humans need to play, in infancy, childhood and adulthood, were fascinating. It is well worth seeking out the interview on the Web. As Stuart Brown talked about playing, I realised how important playing has always been as I tried to create art. Every time that I want to experiment, to push out boundaries, to improve as an artist, I have always regarded the experience as play. I had not measured, apparently, the vital role play has in daily life, let alone in art. Licence to do something different, unusual, amusing, distracting, lively - these are all versions one can find in the Oxford English Dictionary as definitions, amongst many, of play. Freedom too is a definition. In other words, play is an integral part of one's creativity as an artist: without it, one is liable to be stultified, stuck and dull. Oh! Think of Manet, Monet, Cezanne, the Fauves, Matisee or Picasso, amongst so many artists - they all show a sense of play in their work, and those works usually herald changes and break-throughs in their development. To say nothing of the spirit of play that one sees among many of the most successful artists of the 20th century, many of whom definitely do not or did not take themselves or the world around them too seriously. It was good to have it reaffirmed in the radio programme today that one needs to play, every day, in all the realms of one's life, but especially in art.